Many third-party tools speed up the process of data collection and analysis. But even if your business uses a $2,000-per-license business intelligence software, you might end up falling short of expectations if your employees are not data literate. Adeptia provides an easy-to-use data integration platform, enabling both nontechnical and technical business users to formulate strategic business decisions based on insightful data. 1) Data literacy is the first step toward business intelligence. What makes Adeptia solutions stand out in terms of teaching employees data literacy? Data literacy calls for a culture in which data is of utmost importance and is valued by all as a pertinent vehicle for decision making. Employees of a data-literate organization must have direct access to data without having to go through an intermediary. In order to build data confidence in today’s competitive analytics economy, using the right technology is absolutely essential. Here the role of Adeptia ’s integration solution comes into play. Adeptia Connect offers a blueprint to driving data literacy. It ensures all the employees of the particular organization, with varying abilities, has the opportunity to gain deeper insight into the data. It brings transparency to the entire organization with its easy to use and easy to access dashboards. Once the company’s employees become more data literate, they can efficiently derive value from the data-driving an enterprise culture of change. 2) Most businesses understand the benefits of electronically binding their ecosystem, but can you explain how your B2B integration platform speeds up customer data onboarding and service delivery? Onboarding ought to be frictionless and flexible for an organization to grow at a faster pace. It allows the organization to improve customer interactions and customer response times, thereby increasing productivity and time to value. Our B2B integration platform increases the speed of customer data onboarding and service delivery with features such as smart B2B connectors, reusable integration templates, application connectors etc. It saves companies the effort of managing integrations through various disparate products and one-off custom code to boot. 3) Even small enterprises these days try to process large files in an attempt to gain and analyze more customer data. But their existing applications can’t handle heavy volumes. How do you address this problem? Data is the heart and soul of organizations today. With an enormous surge in data in terms of velocity, variety, and veracity, the process time has amplified by leaps and bounds. Not to mention, the complexity has magnified substantially. Many organizations that do not have the access to latest technology fails to process these rogue data sets, leading to application failures and breakdown of enterprise data flows, incomprehensible information losses and painful delays in mission-critical business operations. Adeptia acknowledged this problem and introduced a large file data ingestion feature into its current integration solution. It has several benefits. Firstly, it allows organizations to resolve all multi-GB data processing hassles from a single interface. Secondly, near zero latency allows users to handle torrents of data in a flash. Thirdly, the interface our solution enables the business users to have access to pre-built constructs that help to deal with real-time data in action. Further, the computational complexity and speed of processing increases. 4) It’s difficult for many businesses to abandon their chosen legacy business applications. What measures have you taken to ensure that Adeptia’s application integration works seamlessly with existing integration technologies and modern B2B applications? Maintaining existing legacy system is a costly affair. Organizations that do not have access to the current technologies are unable to grow and expand. However, substituting legacy system altogether can also cost an arm and a leg beside being tricky. Adeptia application integration offers the perfect solution. It takes on the challenge of legacy system integration by exposing those legacy systems and offering a gateway for cloud applications and legacy systems to communicate. Adeptia Application Integration and Enterprise Service Bus (ESB) software combines a services-oriented architecture (SOA) with process orchestration to easily automate data flows and connect existing applications both in the cloud and on-premises. 5) For many people, digital transformation means going paperless and using electronic formats to speed up common business processes. But how does Adeptia view digital transformation? Digital transformation is happening, whether you like it or not. So, either you can be part of it or succumb to it. Though there is no silver bullet to becoming digital transformed-it is an ongoing process, But having a set of tactics can be of great assistance. For us, formulating a tactical digital strategy is the first and foremost step towards the path to digital transformation. Then comes technology. 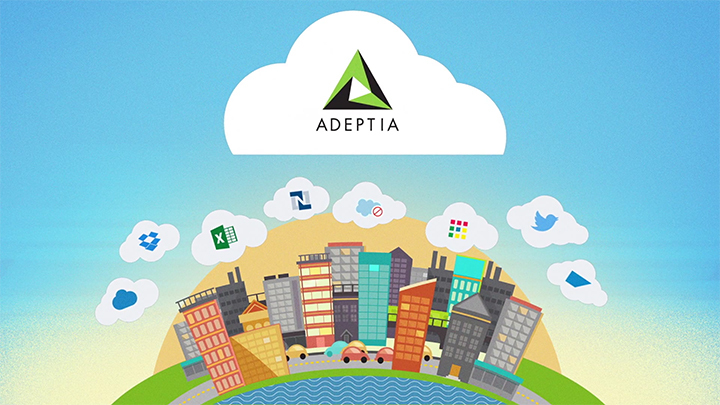 Technological tools such as Adeptia Connect can help enterprises to implement on the strategy with utmost ease and proficiency. It offers data real-time visibility, which means enterprises can keep an eagle-eye on their data throughout its lifecycle from start to finish. With faster onboarding, customers interaction and response times have turned better which, in turn, increases the IT productivity and time to revenue. Having said that, digital strategy is meant to evolve according to the changes in the market, but the utility of integration applications such as Adeptia Connect is not going anywhere anytime soon.